(page counts are approximate, due to unnumbered inserts, cover counts, etc.) So, which do you think provided more news this week? For years we've been watching American media deal with media consolidation, closings of magazines that didn't meet public companies' margin needs, and assimilation of online media into the print/video-dominated world. Lots of jobs have been lost because of this, and many grand old magazines have been butchered because they didn't meet some half-baked ideas that people don't want intelligent content anymore. But sometimes it helps to break out of our provincial worldview here in the United States and see that we're being sold a bill of goods. American magazines have been getting thinner and thinner for years, yet UK publishers roll out giant, high-gloss mags filled with ads and edit pages. Or look to Germany for another case in point. Here in the United States, our news weeklies publish every week and deliver us – what? 68 pages? 72 pages? maybe 88 pages when they stuff in an advertorial? Newsweek recently revamped its design and laudibly promoted the fact that it would target READers. And how many pages were in its first redesigned issue – the one that should draw extra ads because of the publicity surrounding the redesigned mag? I believe it was something like 68. 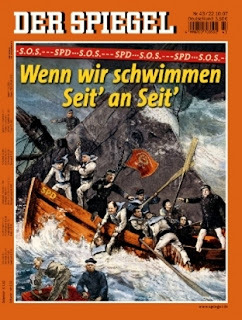 How many pages did Germany's newsweekly Der Spiegel have that week? 206. (Not the same issue that's pictured here; I picture what's available.) And Der Spiegel's not the only game in town in Germany; its competitor, the newsweekly Focus, was also over 200 pages. In fact, Der Spiegel and Focus (as well as Stern, a news/features/personality weekly magazine read by somethinglike one out of every nine Germans) are larger than 200 pages almost every week; on their "thin" weeks, they're only about 140 pages, which would be banner, bumper issues for an American newsweekly. American magazines can do better. They can also deliver a better value to their readers. Until they do, I'll find that value in the European press.